A study has revealed that blue whales that are typically "right-handed" would switch sides when they feed. Most vertebrates tend to favour the right side, as it is the left hemisphere that controls coordination and predictive motor controls. The same goes for blue whales, many of which are "right-handed." However, scientists at the Oregon State University have discovered that the whales that favour the right side would switch sides—that is, become "left-handed"—when feeding. The discovery was made after analysing data based on 2,800 rolling lunges made by 63 whales tagged with motion-sensing tags off the Californian coast. The findings of the study was published in the latest issue of Current Biology journal. When blue whales ascend from the depths directly into a krill patch near the surface to feed on them, they preform 360-degree barrel rolls at a steep angle—and they almost always roll to the left when doing this. This is not a random choice, as doing so allows the whales to keep their dominant right eye on their prey. Lead author and cetacean expert Ari Friedlaender from the University's Marine Mammal Institute explained, "These are the largest animals on the planet and feeding is an extraordinarily costly behaviour that takes time, so being able to maximise the benefit of each feeding opportunity is critical. And we believe this left-sided rotation is a mechanism to help achieve that." "Most of the movements we tracked that involved 'handedness'—perhaps as much as 90 percent—involved 90-degree side rolls, which is how they feed most of the time," he added. 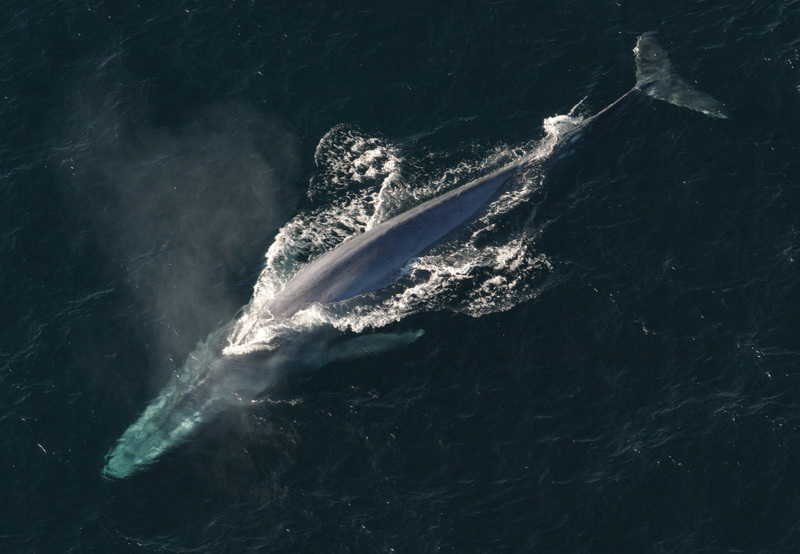 "Blue whales approach a patch of krill and turn on their sides. We found many of them exclusively rolled to their right, fewer rolled just to their left, and the rest exhibited a combination. In addition, the 360-degree barrel rolls were executed almostly exclusively at the surface, and not when the whales were deep in the water column. This was possibly due to the fact that the whales needed sufficient light to see their prey. "To the best of our knowledge, this is the first example where animals show different lateralised behaviours depending on the context of the task that is being performed," said co-author James Herbert-Read of Stockholm University in Sweden.